The Hublot King Power makes a quite the impression. Hardly any other timepiece demands so much attention when on the wrist. It contains the finest in-house technology: from a flyback chronograph to a GMT function all the way to a tourbillon. The King Power is one of the largest models offered by the Swiss luxury watch manufacturer Hublot, whose name means "porthole" in French. This watch is an eye-catcher thanks to its large size of 48 mm alone, but it doesn't stop there. It has large crowns, push-pieces, and crown guards, which emphasize the imposing nature of this series. With its porthole design and six screws on the bezel, the King Power is clearly related to Hublot's Big Bang. The Big Bang is the most successful and iconic Hublot collection. 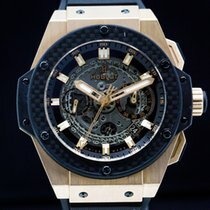 The likes of Usain Bolt, Jay-Z, and soccer players Pelé and Diego Maradona all wear Hublot. Top models in the King Power collection are made of red King Gold or carbon and feature in-house calibers with a chronograph function, minute repeater, and tourbillon. In keeping with Hublot's philosophy, this watch is a fusion of state-of-the-art materials and traditional complications. However, it comes at a price: A King Power Minute Repeater Chronograph Tourbillon easily costs more than 149,500 USD. 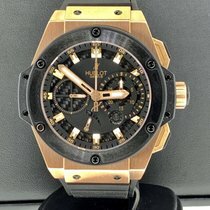 How much does a Hublot King Power cost? Within the Hublot King Power line, you will find numerous limited editions. This includes the King Power Aryton Senna in carbon, which had a limited run of 500 pieces. This timepiece was inspired by motorsport and commemorates the three-time Formula 1 World Champion. Plan to spend around 24,400 USD for a pre-owned model. The King Power F1 honors the entire racing series instead of one specific driver. The ceramic version had a limited run of 500 pieces and sells for around 13,800 USD. If you prefer the 18-karat rose gold edition, you will need about 23,000 USD. Only 250 copies of this timepiece were ever made. The King Power F1 Suzuka is also limited to 250 pieces and is dedicated to the Japanese Grand Prix, which takes place at the Suzuka International Racing Course. Its ceramic bezel resembles a brake disc, and the case is made of especially corrosion-resistant zirconium. The red and white color scheme is a nod to the Japanese flag. In terms of price, be prepared to spend around 20,200 USD on one of these timepieces. Some Hublot models celebrate other sports, such as soccer. 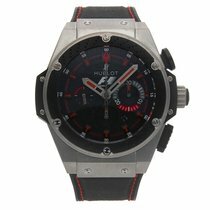 The 'Hublot' name has been a part of every World Cup, European Championship, and Champions League match for some time now. In the run-up to the World Cup in Russia, the manufacturer released the Big Bang Referee 2018 FIFA World Cup Russia. This smartwatch is limited to a run of 2,018 pieces, one of which will go to each of the tournament's referees. Watch and soccer fans alike will have to shell out a good 4,600 USD if they want to call this watch their own. The King Power FC Bayern Munich is geared toward fans of Germany's most successful soccer club. It's impossible to miss the club's logo at 3 o'clock. The club colors—blue, white, and red—dominate the dial. This model is limited to 200 pieces and costs around 15,600 USD. Hublot created the King Power Los Angeles Lakers in honor of the famed American basketball team from the City of Angels. The dial and strap of this carbon watch are in the team colors, yellow and purple, and the Lakers logo is located at 3 o'clock. There are only 50 of these sports watches in existence. At their introduction in 2013, they were listed at 32,300 USD. Another King Power model is dedicated to basketball star and three-time NBA champion Dwyane Wade . This black ceramic watch has a red-trimmed bezel and red accents on its dial. You can purchase this chronograph for about 10,000 USD. The Hublot King Power Oceanographic 4000 is one of the world's most robust diving watches. This model is water resistant to 4,000 m (400 bar, 13,123 ft). As a comparison, the Rolex Sea-Dweller Deepsea is water resistant to 3,900 m (390 bar, 12,795 ft). Diving watches require sturdy designs to withstand the pressures found at great depths. This often affects the watch's thickness: The Hublot King Power Oceanographic 4000 measures in at almost 22 mm. The sapphire glass alone is 6.5 mm thick. Like the crown and bezel rotator, the titanium case back is screwed down. Titanium comes with numerous advantages: It doesn't rust and is resistant to the effects of salt water. What's more, it's significantly lighter than stainless steel. The Oceanographic 4000 is limited to a run of 1,000 pieces. It costs about 10,500 pre-owned and 13,100 USD new. With a run of only 500 pieces, models in black carbon are even rarer and more expensive: Pre-owned watches go for around 12,700 USD, while those in mint-condition sell for 18,000 USD. The caliber HUB1401 powers both versions. This movement is based on the Valjoux 7750 chronograph caliber, though it lacks a stopwatch function. Hublot introduced their internally developed chronograph caliber Unico with a flyback function in 2010. This movement also ticks away inside the King Power Unico All Black. The Unico caliber HUB1240 is hand wound and has a 72-hour power reserve. This solid black watch made of ceramic and coated titanium costs around 13,200 USD pre-owned and 15,600 USD new. The King Power Unico GMT also features an in-house caliber and shows the time in 24 time zones simultaneously. It is driven by the caliber HUB1220 with a GMT function, though it lacks a chronograph mechanism. The case comes in black ceramic or 18-karat King Gold. You can buy the latter for about 24,200 USD pre-owned and 32,500 USD new. The ceramic version demands as little as 15,000 USD and as much as 20,500 USD. If you're in the market for a carbon model, you should take a closer look at the King Power Unico All Carbon . Pre-owned examples go for around 16,100 USD, while never-worn pieces sell for about 20,700 USD. The Hublot King Power series has an incredible variety of models. You have the choice between titanium or 18-karat gold for the case. The red gold versions use the in-house alloy King Gold, which has a much more intense red tone than normal red gold. Hublot creates this color by using a higher percentage of copper in their alloy. Metal specialists also add platinum in order to prevent the color from fading over the years. Some models are set with countless diamonds on the bezel and case. High-tech materials such as ceramic or carbon fiber are also used. Ceramic is incredibly lightweight, hard, and scratch-resistant. Moreover, the black ceramic timepieces have an especially refined look. Carbon fiber is widely used in motorsport since it's especially light yet sturdy. Carbon watches have a particularly sporty look. If you prefer functional sports watches, then you'll find something in the King Power series for you as well. There are many variants with a chronograph function for timing. The flyback chronographs are even more exclusive and of higher quality. There are some very special watches powered by the Unico in-house caliber. Hublot developed this chronograph movement completely in-house. Very few luxury watch manufacturers have their own chronograph calibers. The Unico allows Hublot to join the ranks of Rolex, Patek Philippe, and Zenith. Are you always traveling? Consider a King Power watch with a GMT function. These timepieces display not only the local time, but also your home time. Other highlights include King Power models with a tourbillon and chronograph function. The Hublot King Power Oceanographic Diver 4000 is an extremely robust diving watch. The 4000 in its name reveals its water resistance: It can withstand pressure up to 400 bar, equal to 4,000 m or 13,123 ft. The version with a chronograph function is water resistant to 1,000 m (100 bar, 3,281 ft). Both versions of the Oceanographic Diver feature a helium escape valve. If you're interested in purchasing a King Power from Hublot, you should be aware of its large, 48-mm diameter and thickness of almost 18 mm. Such an imposing watch is not the best choice for every wrist. However, if it's your style, there's no better watch for you. The diving watches Oceanographic 4000 and 1000 appear even larger thanks to their screw-down crown and flip-open guard. Yet, this makes the King Power Oceanographic 4000 incredibly robust. What's more, thanks to its long rubber strap, it's easy to wear on top of a diving suit. Its size also makes it easier to read underwater. Rolex currently holds the record for the most water resistant watch with their Deepsea Challenge. In 2012, this specialty watch dove to nearly 11,000 m (36,089 ft) in the Mariana Trench while attached to a submarine. The inscription "12,000 m" is on the dial.